Objective: The purpose of the study was to assess parental perceptions and acceptability of a dental home for their preschool children, a new concept in the state of Qatar. Methods: A cross-sectional prospective study was conducted at Hamad Medical Corporation, in the state of Qatar. Parents of infants and children <5 years of age were offered an interview survey. Results: A total of 309 questionnaires were completed (response rate =98%). More than 90% of the participants believed that oral health and dentition affected total-body well-being. Only 18% of parents stated that their children had excellent oral health. Interestingly, more than two-thirds of children had not had a routine dentist visit in the 12 months preceding the interview. Reasons for not having such visits included long appointment times (17.4%), the perception that dental care was expensive (15.5%), the notion that deciduous teeth did not need care (9%), the impression that insurance did not cover dental procedures (8%), unawareness of location of dental centers (4%), the child did not want to go (4%), the notion that children are difficult to handle during a dental procedure (3%), a combination of these factors (33.5%), and other factors (5%). When asked what factors would encourage them to enrol a dental home for their children, almost 20% mentioned speedy appointments followed by dentists specialized in pediatrics (14.3%), child-friendly atmosphere (12%), low cost (12%), close to home (5.7%), none (2.7%), others (2%), and all of the above (32.3%). Conclusion: Counseling by primary-care physicians can increase dental home acceptability in the state of Qatar, especially that access to health care is easy in our community. The ramifications of this change in dietary habits may have decreased the intake of calcium and increased rates of childhood obesity and dental caries.20–22 The objectives of this study were to assess parental perceptions and acceptability of a dental home for their children (aged <5 years) and to delineate factors that are influencing the underutilization of dental health care. This study was cross-sectional. The study was approved by the institutional review board and the Hamad Medical Corporation Hospital Committee (17016/17). A questionnaire adopted from several sources23–27 was validated by experts in our organization. It was composed of 24 items that address parent and child demographics, as well as questions related to parental knowledge of oral health and their attitudes and preferences in building a dental home for their children. We chose a convenience sample of 300 participants. There have been no similar studies to extrapolate or calculate the sample needed. Parents were approached during their visits to our outpatient and inpatient departments. We excluded parents of children with such conditions as developmental delay, musculoskeletal disability, and respiratory compromise, as their needs in a dental home could be very challenging. Verbal consent was taken after explaining the objectives of the study, and participants were informed of why the information was being collected and how it would be used for effective patient-care management. Parents were informed that their participation was voluntary and that their answers were confidential and anonymous. Families did not receive any type of compensation for participating in the study. We also informed them that the project had received approval from Hamad Medical Corporation Ethics Committee. Some of the families preferred face-to-face interview, while others opted to complete the questionnaire by themselves. Qualitative and quantitative data are expressed as percentages. Descriptive statistics were used to summarize demographics and all other characteristics of the participants. Associations between two or more qualitative or categorical variables were assessed using c2 tests. For low frequencies, c2 with continuity-correction factor or Fisher’s exact test was applied. A two-sided P-value <0.05 was statistically significant. Some data were missed, since the study was survey-based. Missed data were not accounted for in the analysis. All statistical analyses were done using SPSS version 21.0 (IBM, Armonk, NY, USA). A total of 309 questionnaires were completed (response rate 98%). Approximately 85% (n=257) of participating parents were 20–39 years of age, and 70% (n=212) were females. Table 1 summarizes the demographic characteristics of participants. When assessing parental knowledge and awareness of dental health, >90% (n=272) of participants believed that oral health and dentition affected total-body well-being. Approximately a fifth (n=54) stated that their children had excellent oral health. Parents were eventually asked to describe the dental issues their children possessed, and almost a third mentioned multiple problems (pain, cavities, halitosis, broken teeth, and tooth discoloration), while 20% (n=60) complained solely of cavities. Table 2 summarizes parental knowledge and awareness of dental health. In terms of brushing intervals, our study showed that 47% (n=146) of children brushed twice a day. Of those who brushed their teeth, almost 20% supplemented brushing with dental floss or mouthwash. We inquired about parental supervision of brushing teeth, and found that 86% (n=267) of participants advised and monitored, 7% (n=21) advised but did not monitor, and the rest did not care. Interestingly, more than two thirds of children had not had a routine dentist visit in the 12 months preceding the interview. The reasons for not having had such visits are summarized in Table 3. Parents were asked about factors that would encourage them to enrol a dental home for their children, and answered speedy appointments (n=57, 18.4%), child-friendly atmosphere (n=37, 11.7%), dentists specialized in pediatrics (n=43, 13.9%), low cost (n=36, 11.7%), close to home (n=17, 5.5%), others (n=6, 1.9%), and none (n=8, 2.6%). 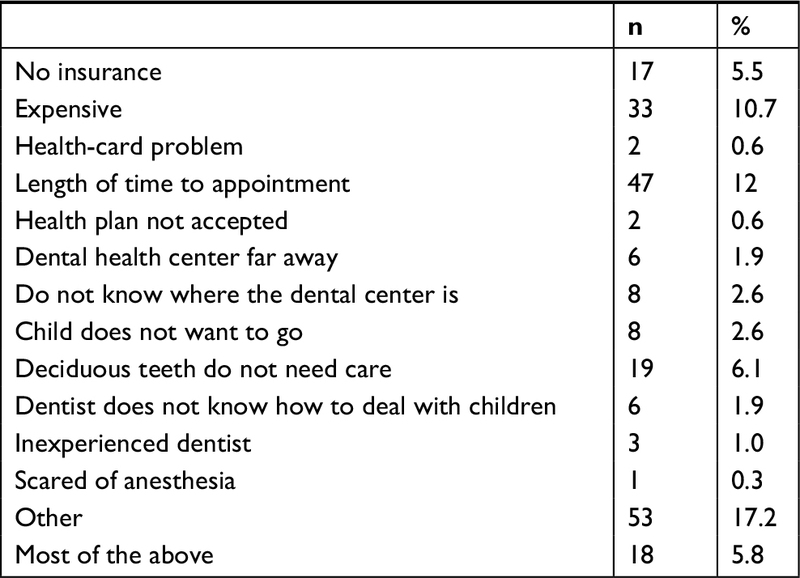 It is worth mentioning that >70% (n=212) of parents believed that the primary pediatrician of the child should start the dental home process. Finally, the level of education and age-group of parents did not influence the idea of creating a dental home for their children (P=0.6 and P=0.585, respectively). Our study provides important new literature related to oral health in preschool children. To our knowledge, this paper is the first in the state of Qatar and in our geographical region to deal with the concept of acquiring a dental home for preschool children. The findings of the present study show that a substantial number of families perceive oral health issues in their children. The high rate of this perception may reflect a lack of community awareness and perception that prevention and management of caries should begin in preschoolers. In addition, there was parental indifference related to the perception that deciduous teeth are replaceable by permanent teeth. In addition, those costs may dramatically increase with delaying the first visit to 5 years of age. Although most of our participant parents were aware of the effect of dental health on total-body well-being, over a third did not provide their children with routine dentist visits. The two main reasons behind this omission were related to either delayed dental service or underestimation of the importance of deciduous teeth care. Those barriers can be overcome, especially given the fact that the health system in Qatar provides services to all children residing in its territories. There is a deficiency in the literature available regarding parental knowledge concerning the oral health of their children. Most of the data have been on school-age children, due to easy approachability, which is difficult in preschool children.36 Chhabra and Chhabra37 studied parental knowledge, attitudes, and cultural beliefs regarding oral health and dental care of preschool children in an Indian population. The study of parents of 620 preschool children showed that deficiency in awareness and knowledge of deciduous teeth and parental fear contributed negatively to their children’s dental care. Moreover, oral health practices were revealed to be at low rates. Gussy et al38 examined the oral health-related attitudes and knowledge of parents of children aged 12–24 months living in rural areas of Victoria, Australia. The study included 272 parents of preschool children, and showed that a large proportion of participants showed deficiency in confidence in oral health. Moreover, the majority of parents acknowledged that toothpaste can decrease the risk of dental caries, but did not know that it could be used for preschoolers. This study has considerable strengths, specifically both the quantitative and qualitative feedback. Our study will assist in illustrating the need for dental homes for preschoolers. This study also has limitations. We used a convenience sample. The limitations to external validity are for the most part due to a very new concept. Moreover, there might be a chance that there are specific characteristics related to parental preference in this subject that were not evaluated in this study. Some of the parents opted to have an interview, rather than completing a survey. Despite the fact that there was no coercion or interference from the research team, we consider collecting data by two different methods a limitation. Part of our sample was collected from parents whose children were being followed in the outpatient department, which included parents who provided a higher level of care to their children with regular well-child visits. The sample also included parents of children with medical comorbidities, which could be perceived as more important than oral health. In addition, parental estimation of children’s dental problems may not reflect reality, since children may have oral health issues not identified by parents. Counseling by primary-care physicians can increase dental-home acceptability in the state of Qatar, especially given the fact that access to health care is easy in our community. The Hamad Medical Corporation Ethics Committee approved this study (17016/17). World Health Organization. Oral Health. Available from: http://www.who.int/oral_health/en. Accessed August 15, 2018. Petersen PE. World Health Organization global policy for improvement of oral health-World Health Assembly 2007. Int Dent J. 2008;58(3):115–121. Nalliah RP, Allareddy V, Elangovan S, Karimbux N, Allareddy V. Hospital based emergency department visits attributed to dental caries in the United States in 2006. J Evid Based Dent Pract. 2010;10(4):212–222. Elangovan S, Nalliah R, Allareddy V, Karimbux NY, Allareddy V. Outcomes in patients visiting hospital emergency departments in the United States because of periodontal conditions. J Periodontol. 2011;82(6):809–819. Slade GD. Epidemiology of dental pain and dental caries among children and adolescents. Community Dent Health. 2001;18(4):219–227. Anderson HK, Drummond BK, Thomson WM. Changes in aspects of children’s oral-health-related quality of life following dental treatment under general anaesthesia. Int J Paediatr Dent. 2004;14(5):317–325. Thomas CW, Primosch RE. Changes in incremental weight and well-being of children with rampant caries following complete dental rehabilitation. Pediatr Dent. 2002;24(2):109–113. Heller KE, Eklund SA, Pittman J, Ismail AA. Associations between dental treatment in the primary and permanent dentitions using insurance claims data. Pediatr Dent. 2000;22(6):469–474. Haugejorden O, Birkeland JM. Evidence for reversal of the caries decline among Norwegian children. Int J Paediatr Dent. 2002;12(5):306–315. Skeie MS, Raadal M, Strand GV, Espelid I. The relationship between caries in the primary dentition at 5 years of age and permanent dentition at 10 years of age – a longitudinal study. Int J Paediatr Dent. 2006;16(3):152–160. Al-Darwish M, El Ansari W, Bener A. Prevalence of dental caries among 12–14 year old children in Qatar. Saudi Dent J. 2014;26(3):115–125. Allareddy V, Nalliah RP, Haque M, Johnson H, Rampa SB, Lee MK. Hospital-based emergency department visits with dental conditions among children in the United States: nationwide epidemiological data. Pediatr Dent. 2014;36(5):393–399. Mcgrath C, Bedi R, Dhawan N. Factors influencing older people’s self reported use of dental services in the UK. Gerodontology. 1999;16(2):97–102. The American Academy of Pediatric Dentistry (AAPD). Policy on the dental home. Reference Manual V 37/NO 6 15/16. Available from: http://www.aapd.org/media/policies_guidelines/p_dentalhome.pdf. Accessed March 27, 2018. Nowak AJ, Casamassimo PS. The dental home: a primary care oral health concept. J Am Dent Assoc. 2002;133(1):93–98. Casamassimo P, Holt K. Bright Futures in Practice: Oral Health. Pocket Guide, 2nd ed. Washington, DC: National Maternal and Child Oral Health Resource Center; 2014. American Academy of Pediatrics Section on Pediatric Dentistry. Oral health risk assessment timing and establishment of the dental home. Pediatrics. 2003;111(5):1113–1116. Alkhtib A, Ghanim A, Temple-Smith M, Messer LB, Pirotta M, Morgan M. Prevalence of early childhood caries and enamel defects in four and five-year old Qatari preschool children. BMC Oral Health. 2016;16(1):73. Al-Thani MH, Al-Thani AA, Al-Emadi AA, Al-Chetachi WF, Akram H, Poovelil BV. Oral health status of six-year-old children in Qatar: findings from the national oral health survey. Int J Dent Hyg. 2018;16(2):225–232. Bener A, Al Darwish MS, Tewfik I, Hoffmann GF. The impact of dietary and lifestyle factors on the risk of dental caries among young children in Qatar. J Egypt Public Health Assoc. 2013;88(2):67–73. Marshall TA, Broffitt B, Eichenberger-Gilmore J, Warren JJ, Cunningham MA, Levy SM. The roles of meal, snack, and daily total food and beverage exposures on caries experience in young children. J Public Health Dent. 2005;65(3):166–173. Tewfik I. Childhood Obesity Prevention (CHOP) programme: a conceptual framework for nutrition intervention. Int J Food Safety Nutr Public Health. 2008;1:16–32. Hendaus M, Jamha H, Siddiqui F, Elsiddig S, Alhammadi A. Parental preference for fluoride varnish a new concept in a rapidly developing nation. 2016;10(2147):1227–1233. Kenney MK, Kogan MD, Crall JJ. Parental perceptions of dental/oral health among children with and without special health care needs. Ambul Pediatr. 2008;8(5):312–320. Al-Omiri MK, Al-Wahadni AM, Saeed KN. Oral health attitudes, knowledge, and behavior among school children in North Jordan. J Dent Educ. 2006;70(2):179–187. Ortiz FR, Santos MD, Landenberger T, Emmanuelli B, Agostini BA, Ardenghi TM. Comparison of Face-To-Face Interview and Telephone Methods of Administration on the Ecohis Scores. Braz Dent J. 2016;27(5):613–618. Rajalingam S, Rani VL. A descriptive study on awareness about oral health among pediatric practitioners in Kanchipuram district. J Pharm Bioallied Sci. 2016;8(Suppl 1):S144–S146. Phelan C. The Blue Book oral health program: a collaborative partnership with statewide implications. Health Promot J Austr. 2006;17(2):109–113. Hale KJ, American Academy of Pediatrics Section on Pediatric Dentistry. Oral health risk assessment timing and establishment of the dental home. Pediatrics. 2003;111(5 Pt 1):1113–1116. Acs G, Lodolini G, Kaminsky S, Cisneros GJ. Effect of nursing caries on body weight in a pediatric population. Pediatr Dent. 1992;14(5):302–305. Gift HC, Reisine ST, Larach DC. The social impact of dental problems and visits. Am J Public Health. 1992;82(12):1663–1668. Texas Dental Association. Building better oral health: a dental home for all Texans. Tex Dent J. 2008;Suppl 1:1–56. Sheller B, Williams BJ, Lombardi SM. Diagnosis and treatment of dental caries-related emergencies in a children’s hospital. Pediatr Dent. 1997;19(8):470–475. Kanellis MJ, Damiano PC, Momany ET. Medicaid costs associated with the hospitalization of young children for restorative dental treatment under general anesthesia. J Public Health Dent. 2000;60(1):28–32. Qatar’s Health System. Hukoomi. Available from: http://portal.www.gov.qa/wps/portal/media-center/news/news-details/qatarshealthsystemrankedthirteenthworldwidefirstinme. Accessed March 27, 2018. Holm AK. Education and diet in the prevention of caries in the preschool child. J Dent. 1990;18(6):308–314. Chhabra N, Chhabra A. Parental knowledge, attitudes and cultural beliefs regarding oral health and dental care of preschool children in an Indian population: a quantitative study. Eur Arch Paediatr Dent. 2012;13(2):76–82. Gussy MG, Waters EB, Riggs EM, Lo SK, Kilpatrick NM. Parental knowledge, beliefs and behaviours for oral health of toddlers residing in rural Victoria. Aust Dent J. 2008;53(1):52–60. Hakim RB, Bye BV. Effectiveness of compliance with pediatric preventive care guidelines among Medicaid beneficiaries. Pediatrics. 2001;108(1):90–97. Green W, Kreuter M. Health promotion planning: an educational and ecological approach. 3rd ed. Mountain View, CA: Mayfield Pub. Co.; 1999. Lewis CW, Grossman DC, Domoto PK, Deyo RA. The role of the pediatrician in the oral health of children: A national survey. Pediatrics. 2000;106(6):E84. Helfenstein U, Steiner M. Fluoride varnishes (Duraphat): A meta-analysis. Community Dent Oral Epidemiol. 1994;22(1):1–5. Krol DM. Children’s oral health and the role of the pediatrician. Curr Opin Pediatr. 2010;22(6):804–808. Siddiqui F, Hendaus MA, Leghrouz B, et al. Parental Attitude in Acquiring a Dental Home for Young Children: A New Concept in Arab State of Qatar. Pediatrics. 2018;142(1):MeetingAbstract. Available from: http://pediatrics.aappublications.org/content/142/1_MeetingAbstract/430. Accessed October 2, 2018.